The interior of the bowl with extensive blue printed decoration. 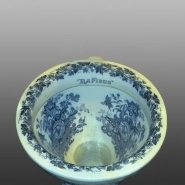 A sanitary ware wash down water closet, decorated inside and out with underglaze blue printed patterns. The exterior has a tall graceful Iris which is the full height of the WC; the bowl has a wreath of grapevine around the rim and bouquets of flowers inside the bowl. The name Rapidus may refer to the shape rather than the pattern, as similar models have been noted with much less printed decoration.